Away from the cops we run. And we’ve run out of places to go-o. We stay out of sight, you know. And the cops? Off to jail we go. City Council’s hats I spy. ‘Cause developers bought them a pie. We are residents just like you.. But we have hopes and dreams do come true. To escape from being caught. That sleep’s against the law. You’re bound to go to jail. I still don’t have a home. In a jail free camping zone. Since alternate building materials are the norm. And there’s no reason left for war. Currently aggressive panhandling and soliciting for donations from a median or off-ramp of a freeway is against the law. Their proposed changes would make it against the law to panhandle within 30 feet of an ATM, financial institution door, transit center, bus stop, driveway to a business, or directly from someone sitting in an outdoor café. 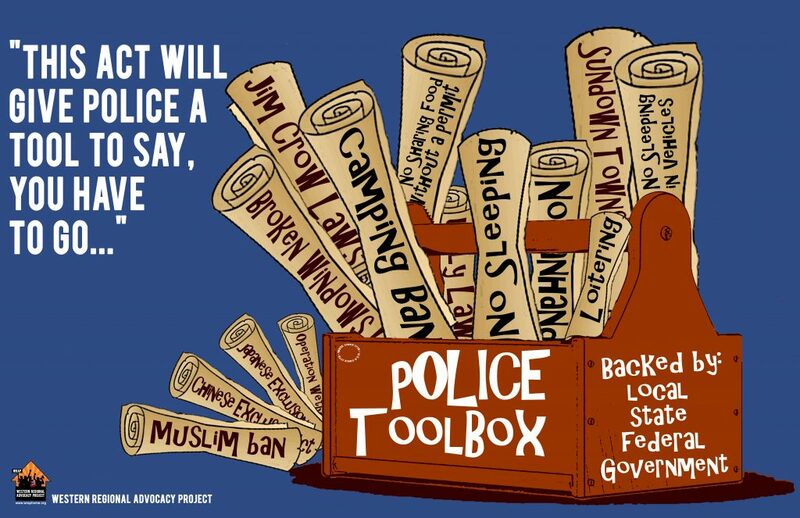 SHOC (Sacramento Homeless Organizing Committee) has been attending community meetings, City Council and Law & Legislation meetings trying to convince them that these new additions infringe on protected free speech, to no avail. At the same time it does not make it against the law to ask a stranger what time it is, or comment how you like their shoes within 30 feet. You can still legally approach someone at the ATM machine and say, “Did you watch the game last night?” Just don’t say you are poor and in need of some spare change. These changes have been approved by the Law & Leg Committee and will go soon to Sacramento City Council for a vote. Let me tell you about our exciting trip to Seattle! 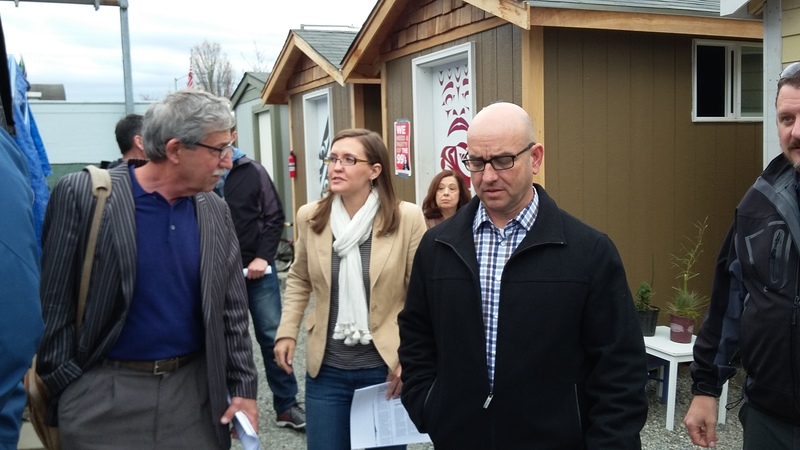 Safe Ground met with City Manager John Shirey this past November and invited him on a trip to Seattle to visit several of their tent and tiny house communities. We were thrilled to find there was great interest by Sacramento city leaders in making the journey with us. Included in this monumental journey were Sacramento City Manager John Shirey, Assistant City Manager Dangberg, City Council Members Harris, Hansen, Guerra and Shenirer, Chief of Police Somers and two others from the Police Department, City Attorneys Trimm and Benner, two from the Mayor’s office, Homeless Services Coordinator Emily Halcon, SSF CEO Ryan Loofboourrow, two Realtor’s Association representative, a photographer, Bee reporter Lillis, author Bill Vollman , and three members from Safe Ground Sacramento. The purpose of our February 26th trip was to learn about the variety of innovative programs that serve homeless people unable to access conventional shelter and housing in Seattle. Our hosts were members of SHARE WHEEL and residents of their three tent and tiny house communities. We toured SHARE WHEEL’s Tent City 3, Tent City 5, Nicklesville in Ballard, and had a lunch meeting with members of SHARE and WHEEL, Low Income Housing Institute, and residents of the three locations. After the lunch Q&A session, Sacramento City leaders met with their Seattle counterparts. Our first stop, Tent City 3 was located out in the suburbs behind their current Church host where they had just stayed for three months. They were getting ready to move to a new location, a University close to downtown Seattle. They have agreed to move the entire encampment every three months. Our second stop was Tent City 5, a place located closer to downtown. Tent City 5 was allowed to stay at their location longer than 3 months. Our last visit was Nicklesville at Ballard, where they provided a mix of tents and tiny houses. All three communities have proven to their hosts and the surrounding residents to be good neighbors, making security patrols every night and doing daily “trash busting” to keep the neighboring areas clean. The communities are run by the residents with a weekly rotation of four executive committee members. Members are required to participate in weekly meetings and chores. There are no drugs or alcohol allowed and residents are expected to maintain a basic code of behavior. Though there was a limited amount of tents at each encampment, each site had an overflow tent which resulted in them never having to turn away a homeless person in need of shelter for the night. We heard from residents about their roles in the community and how the encampments have brought safety and stability to their lives, where otherwise they would be isolated and exposed to the harsh, wet Seattle weather. They have grown a great deal by learning to live in community and developing as leaders and advocates. Housing is very expensive and rising in the area, so living in the tent cities is the next best thing until they are able to find work and find a place they can afford. Safe Ground Sacramento is inspired and invigorated by our visit and we are actively taking advantage of the momentum! DAY 43: City Hall Homeless Protest. DAY 8: City Hall Homeless Hunger Strike. SACRAMENTO (City Hall) – Dozens of homeless camp protesters and supporters will pack City Hall for the Sacramento City Council meeting Tuesday night, demanding inclusion of the homeless on a City Task Force on the Homeless. The taskforce is on the council’s agenda Tuesday evening. James Clark, an organizer and spokesperson for the month-long homeless protest camp at City Hall, marks his 8th day without food Tuesday. Clark has said he will hunger strike until the new City Task Force on Homeless invites three people from the homeless protest to be on that task force. The city of Sacramento has not responded. “January 5th Mayor Kevin Johnson set up a task ‘farce’ to address homelessness. He appointed three council members, and no homeless. The next week James Lee Clark (Faygo) began a hunger strike demanding that no less than three members of the homeless community be added to that task farce. This week the last item on the agenda is a report back on that task force. (we demand) the city comply by adding three members of the homeless community to the task force so it can have a real effect! The Dept. of Justice has issued a statement of interest in a federal case in Boise, in which seven people sued the city over their conviction for the “crime” of camping. The DOJ in August of 2015 said bans on sleeping in public are unconstitutional. When I was at the National Healthcare for the Homeless Conference in New Orleans in May, I was introduced for the first time to Cantistoria, an art form of telling stories with pictures. Caitlin May incorporated song, props and theatrics in her Big Rock Candystoria, the story of the big pickle we’re in and the history of homelessness. Quit harassing, ticketing or threatening to ticket people for living outdoors; for sitting, praying, laying down, standing or resting on public property as long as they are not blocking passages and entrances! Quit attempting to rid homeless people from downtown or other areas, unless those attempts involve providing housing, shelter, or areas where homeless people can set up a tent near sanitation facilities – voluntarily! Quit similarly prohibiting or discouraging people from being in their legally owned and registered vehicles! Quit locking up and otherwise decommissioning public restrooms! Quit harassing, ticketing or threatening to ticket individuals and groups from eating and sharing food! Quit prosecuting infractions without allowing and providing legal counsel! The above policies inflict added hardships on homeless people, endangers their lives, and prevent them from achieving the stability necessary to end their homelessness. These restrictions we would place on you are in no way asking you to behave in any way contrary to a good conscience. Though this cease and desist order is not intended to be directly associated with any consequential legal threat—we demand this for the good of homeless and other residents of Sacramento. We demand a more moral and just Sacramento! We do, though, hereby pledge to pursue justice in whatever manner we find at our disposal, including but not limited to organizing with other West Coast cities for state-wide Homeless Bills of Rights. We pledge to be unrelenting in insisting on your respect for and protection of human rights, and in restricting you from further criminalization of homelessness and poverty. We also hereby beseech you to take serious steps towards ending homelessness by more proven and prudent measures, such as the provision of housing, jobs, and other programs designed to help homeless people accomplish stability and prosperity. This is a moral imperative!